I just read Tris Lumley‘s post Transforming our Anti-Social Sector along side three posts by Dom Potter: The Story of Social Investment; Rethinking how we support impact driven organizations to start-up; and Collaborative and collective impact for social change. Together, they tell a story of how our best approaches to investing in impact-first ventures are falling short. Incremental improvements to what we are doing are not enough. At the same time, the answer is not in trying to replicate the financial-first startup support ecosystem. Nor is it likely to be ‘something in the middle’. If our goal is a future that is hospitable to humanity, our best efforts will be those that actively help produce systems of society that make it possible. This is quite different than working to make sure that every investment has an impact. Efforts around collective impact, social innovation labs, and social venture incubators and accelerators all hint at how we might do things differently but mostly appear hamstrung by the limitations and constraints we are trying to break free from. 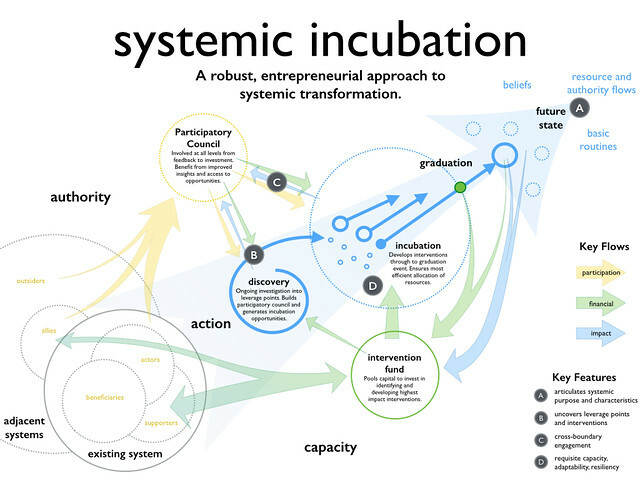 A while back I had put some thoughts together around what systemic incubation might look like, but just realized I never shared it. It’s full of challenges of course, but reminds me what it might look like to shift our focus from generating returns to funders, to creating the conditions for entrepreneurs and innovators to create our future. Maybe sharing it now, can provoke some more questions and ideas for those working to make it happen.